In March 2015, customs officials arrested supermodel Ayyan Ali at Islamabad airport, upon recovering $506,800 from her luggage. Ayyan later denied any role in money laundering. She was released from Adiala prison in Rawalpindi after spending almost four months in detention. Today, a court in Rawalpindi issued arrest warrants for Ayyan in connection with the killing of a customs inspector who would have been a key prosecution witness in the money laundering case against her. The court ordered police to arrest the accused immediately. Warrants have also been issued for others accused in the case, including customs superintendent Zargham and Dr Haroon. Customs Inspector Chaudhry Ejaz Mahmood would have been the key prosecution witness in the money laundering case. Mahmood was in charge of the PIA cargo air freight unit (AFU) state warehouse at Benazir Bhutto International Airport in 2015 and was the person that took official custody of the currency recovered from Ayyan in March 2015. He was shot dead by two unidentified men last year. 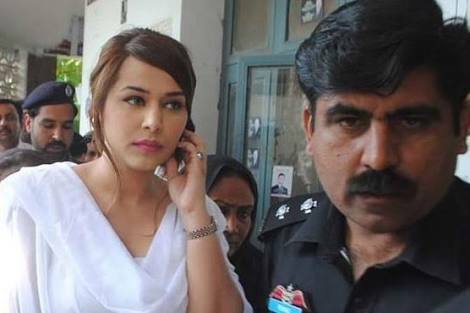 The inspector’s wife told the police that some men threatened to kill Mahmood if he failed to make false entries in the official record to weaken the case against Ayyan and relieve her of the charges. Mahmood’s brother Chaudhry Riaz Afzal also recorded his statement before the police. Ayyan was released but now, a Rawalpindi court has issued arrest warrants and according to the orders, Ayyan needs to be presented in the court within a month.